Diving or snorkeling in the crystal clear waters of the Turks and Caicos Islands are among the most popular things to do on the islands. 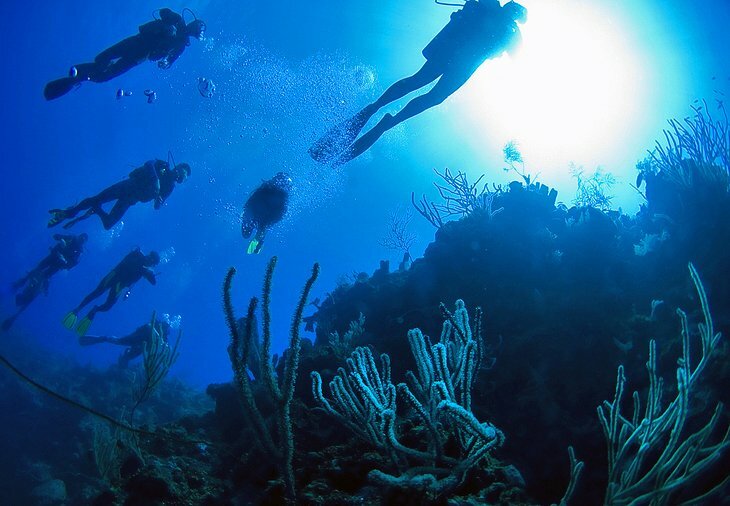 Surrounded by one of the most extensive coral reef systems in the world, the islands sit on a vast underwater plateau with dramatic drop-offs not far from shore, making it an excellent destination for wall dives – especially in Grand Turk. Many of the top snorkel and dive sites are accessible from shore, and shipwrecks old and new are sprinkled throughout these waters. Another interesting feature of the islands is the 35-kilometer-wide Columbus Passageeast of Grand Turk, which separates the Turks from the Caicos islands and is a popular migration route for marine animals. Depending on the time of year, divers can see whales, dolphins, turtles, and rays here. Add to all this excellent visibility, unspoiled reefs, abundant marine life, and quality dive services, and it’s no wonder this is one of the best diving destinations in the Caribbean. Most of the diving and snorkeling tours operate out of Providenciales, Grand Turk, and Salt Cay.